As I wrote earlier this week, last Friday I was in Nebraska visiting the Joslyn Art Museum and having one of the happiest days I've had in a long time. I was with my cousin and her daughter, people I haven't seen for a very long time, and I was at this small, beautiful art museum - and I love art museums. The variety of their collection really surprised me - the depth of it for such a small museum was truly marvelous. So I'm sharing some pieces with all of you today. First, this is called "Fallen Angels" by Cibot. A nice view of 'evil' personified. 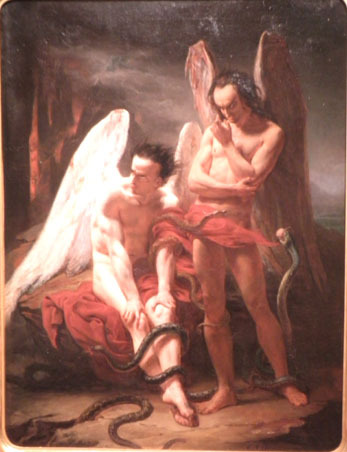 I particularly love the snakes crawling all around the bottom of the angels and their receding hairlines. I guess those who fall from grace aren't allowed to still look breathtakingly beautiful? 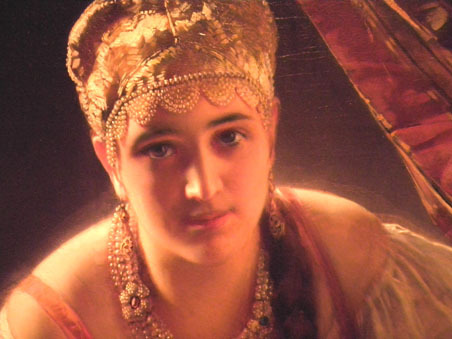 This is a detail look at a round piece with incredible light control - "Russian Beauty with Cat" by Makovsky. I loved the light, her outfit, and her face. She was stunning and I could have stood immobile in front of her for hours. 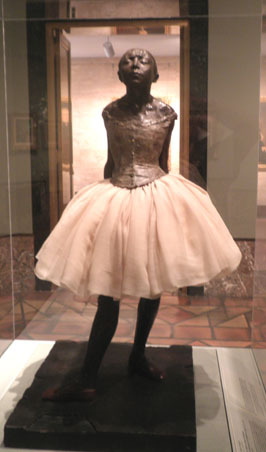 There is a very nice Degas bronze of one of his child ballerinas. They have replaced the skirt - those need replacement periodically, but the expression on the little girl's face is precious. 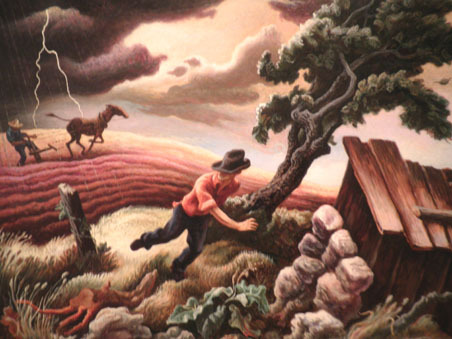 One of my favorite American artists is Thomas Hart Benton, and his "Hail Storm" has been a piece I've seen in books for years. To stand in front of it and study it - I want to go back to the Joslyn just to spend time in front of this picture. I love it. And finally, a pic of one of the wonderful items in their sculpture garden. 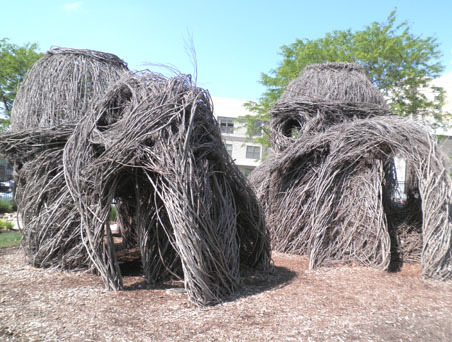 These whirled stick structures invite exploration and each one of us wandered through the narrow pathways and doorways. They were mysterious and intriguing, with a touch of sadness. Current Location: Messy desk, messy house, messy life. Sigh! I think I would have liked the sculpture garden - I love paintings but sculpture is my favourite. There were fountains, bronze statuary, steel structures, inlaid mosaic work in the paving stones, and lit multi-colored plexiglass tables. It really was a nice garden, slightly separated into an adult version and a more child-oriented version. These were in the children's section. "Russian Beauty with Cat" -- is that a painting? It looks like an exquisite photograph. It's quite extraordinary what the artist did with lighting on this one and I just love the piece. That really is one of the most beautiful paintings - I would happily stand there and gaze at it with you. RE: the art, were you allowed to photograph the pictures or were these from museum postcards? We've got the Crocker out here and no photos are ever allowed; I do wish they had a selection of buyable cards as some of the art there is stuff I've seen for decades and would love to be able to look at from home as well - more as reminder than anything else. They are quite tall - easily 10-12 feet, some even a bit more. I just loved them. As for photography, most art museums will allow you to photograph without flash except for special exhibits. I wasn't too happy with the quality of photo that I was getting this time around, so it's probably time for me to start shopping for another new camera. I did buy postcards of the two demons, the Hail Storm, and the Russian Woman with Cat, but these are my own photos, not the cards. Those are all lovely. I like the little ballerina best - I always love bronzes. I love Degas, and usually it's just his paintings that are shown. Having one of his bronzes was a special treat. Thanks for sharing. What great art. I'm glad you had a good time. It was a lovely vacation. I'm delighted that you enjoyed sharing some of the artwork.